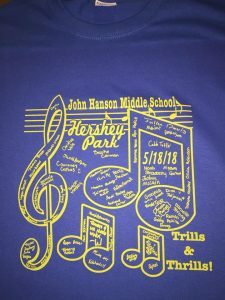 The John Hanson Middle School Band played a festival at Hershey Park. They called it Trills and Thrills. For this design, I dropped off a special template and a Sharpie. After all the kids signed the template, I picked it up and turned it into a one-of-a-kind custom tee, complete with all their signatures! These tees work best for smaller groups (under 100) and I’ve used them for graduating classes, band trips, and sports teams.